"Do-It-Yourself Shingled Roofing with THOR Roofing Tools ... do-it-yourself roofing, new roofing tools, do-it-yourself, tools, help, roofers, shingling, roofing tapes, diy, reroofing, layout tape, hand tools, shingled, manufactured housing, modular construction, modular, fiberglass, asphalt, contractors, help habitat, homeowner, DIY, chalk, chalk powder, construction, chalker, magichalk, permachalk, blt, shingles, tape, roofers, roofs, manufacturer, chalkers, shingled, help, equipment, log homes, THOR, free, measurements, builder, builders, chalking, contractor, contractors, lines, reveal, reveals, courses, tip, tips, tool, dormer, dormers, easiest, exposes, exposure, fastest, gable, gables, helpful, hints, hip, homeowner, installer, installing, Kingston, marks, marking, measuring, measurement, newest, safest, striking, string, save, shingling, diy's, new"
When installing a shingled roof, the manufacturer will have some basic directions on the shingle packaging, urging the use of the shingle bottoms to install a roof. Today, few roofers utilize this process. 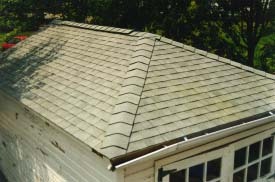 Most will snap lines to locate where the shingle tops should be aligned and then place the shingles along those lines for nailing. To remove any human error from that measuring process, Roofing Layout Tapes by THOR Systems, Inc. of Larksville, PA, USA are recommended. Simply fold the tape at the "Eave Start Here" mark, forming a clip just like that on a tape measure, which is then placed on the drip edge at one side of the roof line. The tape, which is a disposable unit, is then nailed or stapled permanently to the roof, from eave to peak. 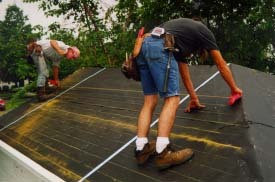 This process is then repeated on the other side of the roof, thus providing all of the required markings for the tops of the shingles with computer accuracy. These tapes also provide a built-in, 3/8" shingle overhang of the drip edge, without any manual measurements. Next, lines are snapped between the tapes to locate the correct positioning of the tops of the shingles for installation. If two people are working on this roofing installation, an ideal tool for this line marking activity is the Double Chalker, also by THOR Systems, Inc. This tool offers several advantages, including a woven, 100% polyester line, which will yield 8-12 lines per chalk load; a large chalk capacity of over 16 ounces; and two independent dispensers that eliminate the dangerous and time consuming activity of walking back and forth across the roof just to put fresh chalk on the line. Remember, pull tight, but snap light for chalking without walking, yielding 8-12 lines per load. 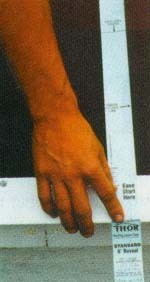 However, since the Double Chalker line holds so much chalk, chalk over-spray is experienced when using this tool, so we further recommend the use of Magichalk, a yellow, non-staining chalk powder specifically formulated to reduce the risks of stains and blemishes in the workplace, caused by the use of chalk powders. THOR Roofing Tools have received rave reviews in "Journal of Light Construction" magazine, July 2000, page 74, "Fine Homebuilding" magazine, May 2000, page 128, "Today's Homeowner", April 2000, page 25 and "NW Builder" magazine, March 2000, page 51, for additional reference. Once the lines have been snapped across the roof from eave to peak, the actual installation of a perfect roof has been formatted and ready for execution. Remember, every other course of shingles must be offset by six inches to provide the overlap needed to eliminate leakage, which is also laid out by the THOR Tapes, too. If plumbing vents or chimneys or other roofing obstacles are encountered where the lines can not be struck between the two original tapes, simply place a piece of leftover tape on each side of that obstruction, aligning the tape’s markings to the last line struck, to be able to easily and perfectly navigate around that obstruction, whether it is a dormer, skylight, chimney, plumbing pipe or anything else that blocks the snapping of lines between the two tapes. Simple, fast and accurate shingled roofing installations are now made possible with these new roofing tools. This garage roof took two men two hours to install the felt and shingles! For further information about these and other new roofing and hand tools, visit THOR Systems, Inc. "The Helper Of Roofers" at www.thortools.com. ©2001-2011 THOR Systems, Inc. "The Helper Of Roofers"